Schools across the country are under pressure to teach more math and science courses. Since educational funding is finite many are eliminating art, music, and drama in the process. The authors of The Muses Go to School have provided fresh proof of the vital role the arts plays in educating students. Though the evidence in the book is anecdotal, it is compelling. Herbert Kohl and Tom Oppenheim have edited a collection of autobiographical essays by famous people in the arts world who tell their own personal stories about the difference arts education made in their lives. Each artist’s personal story about his or her engagement with the arts is accompanied by an analysis from an educator who gives insight into the particular artist’s transformative experiences. With so much research available on learning differences among children, the argument for retention of drama, music, creative writing, and dance programs is especially compelling. “The idea that somehow the arts aren’t as important as reading, writing, and arithmetic is generally held by people who haven’t had a child who needed other ways to learn. . . . No one is left out of the arts,” says Goldberg. The artists in the book advocate more arts emphasis in education not necessarily so there will be more artists, but so young people will be able to discover a means of identity and self-expression, losing the fear of exploring their true potential in the process. “This sense of possibility is not encouraged enough in education,” says Hoffman, who sits on the board of a public school in the Bronx in which everything in the curriculum is influenced by the arts. Mr. Kohl says rigid educational delivery and emphasis on test performance is creating a dichotomy in students’ lives. For a large part of the day, they sit encoding information and then taking tests. The other part of their lives is deeply involved in social media, making their own videos, creating graphics, and communicating creatively. In most cases, these activities are completely separated from the academic learning process. Mr. Kohl advocates integrating creative activity into all aspects of learning—drama, dance, music, and the visual arts. 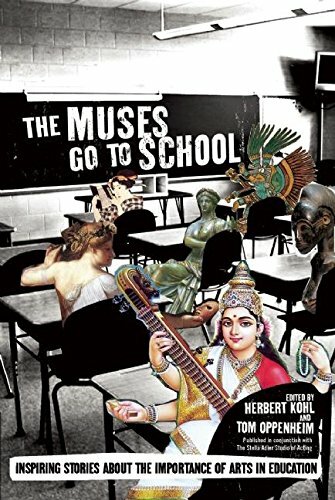 Parents fighting to keep band, orchestra, drama, and dance programs alive in their children’s schools need to read The Muses Go to School: Conversations About the Necessity of Arts in Education and send copies to their legislators. chaired a coalition that succeeded in introducing mandatory bullying prevention training in Miami public schools.Kathy currently serves on the Miami Dade County Public Schools Student Services District Advisory Committee. She is also the author of the book, Protect Yourself From Crime, and has published widely in both magazines and newspapers.